Tashlin directed some of the Daffy Duck cartoons of the 1940s. 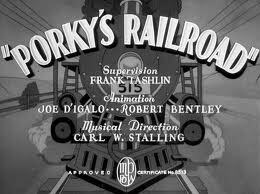 Tashlin was also associated with the Porky Pig cartoons. 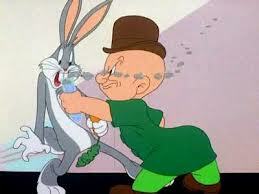 Scene from one of the Bugs Bunny cartoons directed by Tashlin. Even the credits made exemplary use of the wide-screen process. Fast inter-cutting and unusual perspectives added to the impact of the rock 'n' roll dance scenes. Jerri Jordan (perfect name for a 1950s singer) is the target of Tashlin's attack on the music industry and show business. 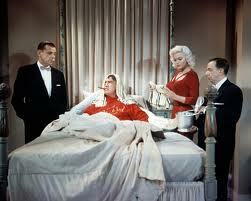 The Girl Can't Help It's director, Frank Tashlin (see below) not only delighted in risque humor. He was also an astute observer of American popular culture. Above all he was a master of visual comedy who delighted in surrealistic manipulations of spatial and visual conventions. At a time when the new wide-screen format was in its infancy, and both feared and scorned by many of Hollywood's best directors, he delighted in exploiting the CinemaScope frame for its visual, comic and dramatic possibilities. In 1956 the young French director-film critic Jean-Luc Godard invented the term 'Tashlinesque' to describe his willingness to experiment with color, screen format and to incorporate the frenetic pace and animation elements in his feature movies. These aspects of Tashlin's cinematic oeuvre undoubtedly owe much to the director's early career as an illustrator and cartoonist, as well as making animated cartoons for the screen, working for Disney, Screen Gems and Warner Bros.
Ribald sexual humor has always been a source of comedy since Aristophanes , and Tashlin never hesitated to exploit the opportunities provided by modern American life. Ethan de Seife [Tashlinesque: the Hollywood Comedies of Frank Tashlin] has noted how Tashlin carries the bawdy vaudeville tradition. Thus his films are often vulgar, even tawdry, full of steadily building and recurring visual gags while at the same time making sarcastic comments about American society. They also delight in breaking the 'fourth wall', the barrier between audience and performer. 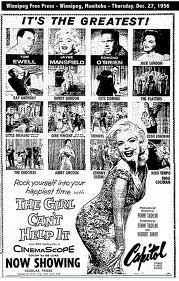 In The Girl Can't Help It he uses Jayne Mansfield, a Marilyn Monroe look-alike, to mock the current Monroe craze. At the same time Jerri Jordan (the Mansfield character) seeks to use a publicity agent to become a singing star despite her unfortunate voice. In the commercial music scene, according to Tashlin, publicity and advertising rather than ability can bring success. And the aspiring star's pneumatic figure rather than her voice will advance her singing career. Yet by the end of the movie she has become a sympathetic figure, who knows herself: 'I'm domestic'. Neither the movie's satirical attack on the popular music industry of the 1950s nor its broad humor are the main reasons behind the enduring success of The Girl Can't Help It. From a musical viewpoint, more than half a century later, it provides a rare opportunity to enjoy some of the most enjoyable rock 'n' roll performers of the fifties filmed by talented craftsmen in settings that enhanced their performances. And from a cinematic perspective, Girl enables us to appreciate the impressive visual and technical dexterity of the director, and to realize how techniques of animation, especially those used in cartoons like Bugs Bunny and Porky Pig, could enhance the comic and visual impact of 'live-action' movies. So the movie starts with Tom Ewell in a small monochrome frame introducing himself to the audience, explaining who he will play and pushing the screen frame until it becomes a Cinemascope ration and then demanding color. To add to this surrealist mood, the opening sequence features musical instruments floating in space, a motif duplicated at the movie's finale. At the very end a leading character walks out of the frame and asks that the audience hear him sing. The famous opening street scene provides a fine example of Tashlin's use of cartoonish features that provide surrealistic humor. As Mansfield does a hip-swaying walk down a street, ice blocks melt, milk bottles froth forth, spectacles crack. 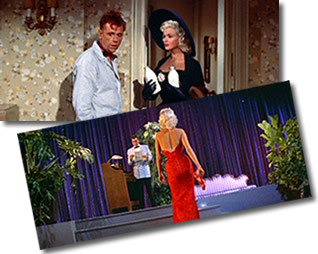 Throughout the movie, the exaggerated responses of males to Mansfield recalls the over-the-top reactions of cartoon characters to the various femmes fatales that they meet. Superb color photography, clever staging, glamorous costumes - this is a different world from that of other rock 'n' roll movies. Even a mundane sequence provides Tashlin and Leon Shamroy, his cinematographer, with a chance to show the effectiveness of the wide-screen format. 'The Girl Can't Help It' is essentially a very sophisticated movie despite its heavy reliance on elements of farcical and sexual comedy. Glamorous and sophisticated singer and song against the background of ...a kitchen. Another one of the film's startling juxtapositions. Finale - the return to the surrealistic backdrop of the credits. Note the domesticity of the children offset by the sophisticated clothing of the adults. Indeed, domesticity and its virtues is one of the surprising themes of the movie. Widescreen was in its early days, but Tashlin makes superb use of its potential to focus audience attention on crucial features. The stark yet glamorous simplicity of costume and color, like a cartoon, highlights the essentials. Frank Tashlin led an amazingly productive life. Not only was he one of Hollywood's most innovative directors. He was also a comic-book artist, author of children's books, a gag-writer for comedians, a screenwriter, a producer and the author of a text on cartoon drawing. A look at Frank Tashlin's remarkable career gives us rewarding insights into the history of Hollywood movie-making in the twentieth century. He was born in New Jersey in 1913, dropped out of school at age 13, and when he was 16 got a job in animation at Fleischer Studios. Tashlin, who constantly moved from studio to studio throughout his career, then worked for another animation company, Van Beuren, working his way up from inker to animator. By age twenty he was working as an animator for Warner Bros. During the 1930s he directed a series of cartoons that featured Porky Pig. During the late 1940s and the war years he worked for several studios, directing cartoons featuring such popular characters as Daffy Duck and Bugs Bunny . His wartime spell at Warner Bros included directing several cartoons aimed specifically at military audiences, such as the Private Snafu series. By the early 1950s he had become a leading writer-director-producer of comedies. His best - Will Success Spoil Rock Hunter?, The Girl Can't Help It, Artists and Models - were immediately acclaimed in France by critics like Godard. The French critical love of the Absurd and Surreal was not reciprocated in the US or the UK. Here Tashlin's movies were condemned as vulgar and frantic. 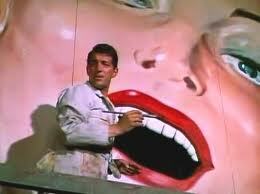 The fact that he made several movies for Jerry Lewis was cause for further condemnation. Lewis's braying, clowning, frenetic persona was adored by French critics, but its very strangeness and abrasiveness was too much for uptight American critics. The tremendous popularity of these Lewis films with mass audiences was another reason for elitist critics to sneer at Tashlin's directorial work during the late fifties and early sixties. His critical reputation in the English speaking world never recovered; in France he remained a revered figure. His last film was made in 1968; he died in 1972. Three directors of comedy: Norman Taurog, Jerry Lewis and Tashlin. 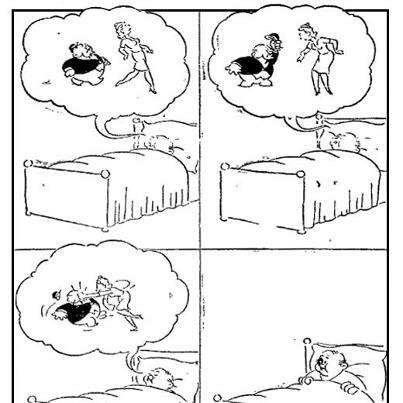 Tashlin drew a cartoon strip - Van Boring - in the early 1930s. Note the frantic sense of movement captured within the frame. 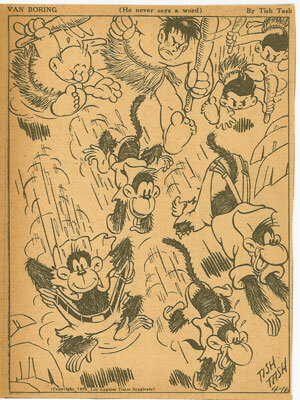 From 1934-1936 Tashlin (under the name of 'Tish-Tash') drew a cartoon strip for the L.A. Times. It was called 'Van Boring': the main character never spoke a word. Tashlin's illustrated children's book is still in print after six decades. It tells of a hibernating bear who wakes to find a factory has been built above him. So he tries to fit in, claiming he's just a man who needs a shave and has a fur coat. Tashlin's illustrative skills, his love of visual trickery and his background in raucous, risque and anarchic vaudeville-style comedy were at once his greatest strengths and the main reasons why he was unappreciated by cultural elites in the USA and UK. His experiments were framing, breaking the fourth wall and flamboyant use of color - all in films made for the masses - were regarded as inappropriate at best, or rubbished at worst. Also overlooked at the time were the subversive messages of some of his movies, especially Girl and Will Success Spoil Rock Hunter? Tashlin was a witty observer of the same entertainment culture in which he was such a talented participant. His cinematic critiques ranged from rock 'n' roll and comic books to Hollywood's star system and muscle building. Films like Girl show how music and movies exploit people for monetary gain - just as that movie is doing by showing it on screen. Tashlin mocked the excesses of consumer society -its advertising, conspicuous consumption, obsession with body image, pursuit of money and possessions - yet most American film critics of the time, many of them on the left, failed to recognize his trenchant condemnations of American society and culture. 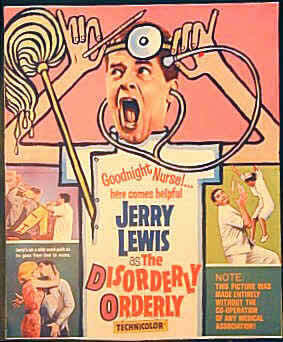 The zany anarchism of the films Tashlin made with Jerry Lewis was regarded with disdain by influential American critics. 'Artists and Models'. a Martin-and-Lewis movie, was crammed with unusual angles and flamboyant use of color. Movie tie-ins with music are commonplace today, but not so in 1957. THis ad conspicuously highlights the music artists in the movie -along with Jayne Mansfield.